Phuket Bath Bomb | £3.75 // I feel like I've said this with a lot of the Kitchen products but I think this is one of my favourites! It's coconut scented which is a scent Lush doesn't use too often and also has a hint of orange to it as well as vetivert. It reminds me of a cocktail and I can't wait to use it. It looks quite a plain one from just looking at it but more often than not, these are the one's that have something special inside. Something Wicked Bath Melt | £3.95 // I really like the scent of this one when it's wrapped up as it's quite subtle but once opened the jasmine becomes just a bit too overpowering for me as I'm not a huge fan of it. I do like the ginger added to it though and I'm thinking of using it in a bath cocktail to try and tone down the jasmine. It does look pretty though and I know it's going to be really moisturising. Avoshower Shower Gel | £10.25 // I really like the Avobath Bath Bomb and have heard of the shower gel version but never tried it. I was excited to see it in the Kitchen at the start of the month but imagined it would sell out so quickly I wouldn't be able to buy a bottle. Luckily I did and I think I actually prefer the scent of the shower gel to the bath bomb. The lemongrass is the most dominant scent, at least to my nose, and I love it. 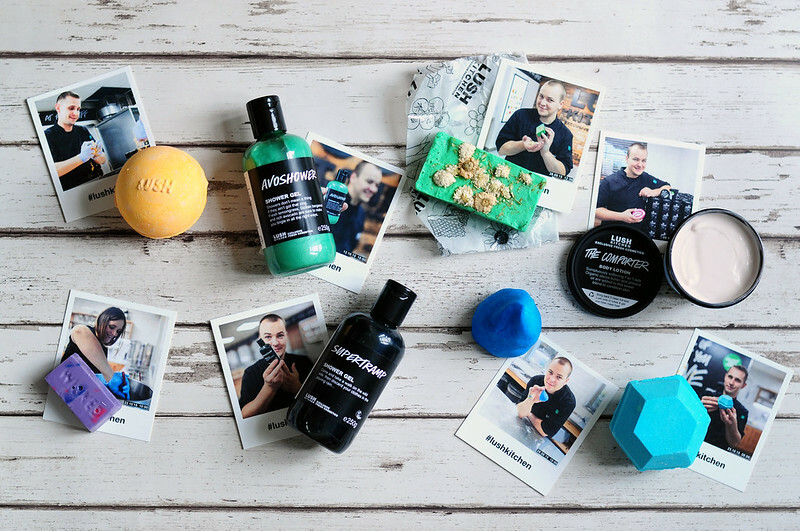 Supertramp Shower Gel | £11.95 // I bought the Supertramp Bubble Bar when it was last in the Kitchen and I fell in love with the sandalwood scent and I was so excited to see the shower gel version in the Kitchen. I can already tell I am going to ration this bottle as I don't know when I'll be able to buy another! Soap Sud Soap | £4 // This was a last minute edition to my order and I'm happy I added it. I tend to use the soaps from Lush as hand soaps so I'll be saving this one until I need it as I'm currently using Yog Nog. It's incredibly bright and almost melts when you pick it up so I can imagine this is going to be pretty moisturising when I get round to using it. If you like freshly mowed grass mixed with chamomile then you'll like the scent of this one. Temple Of Truth Bubble Bar | £3.75 // When this was originally sold, it was a white bubble bar which I actually think I prefer. The blue is just a bit too bright although it does make the water look nice. The scent is a mix of sandalwood, rosewood and guiacwood which gives this bubble bar quite a woody smoky scent and I really like it. The Comforter Body Lotion | £13.95 // Since I already have both The Comforter Bubble Bar and Shower Cream, I just had to try the body lotion so I could use all three together. Yes. it is strong and totally overpowering but I love it! Magic Bath Bomb | £3.95 // This was released in the first week of Halloween products and I actually missed out on getting it the day it was released. The next day was back to the future day so Lush resold it and I managed to buy two. This is another one I've never tried before but so many people were going crazy over it I knew I had to try it. Just look at the shape and colour! This has an unusual combination of marjoram, rose, basil, peppermint and parsley but it actually works. Lovely photo! I'll definitely have to keep an eye out for the Magic Bath Bomb, it looks and sounds amazing!